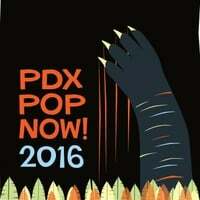 2016 Festival Graphic Artist – PDX POP NOW! Glenn Allen Henrickson is a Portland-based artist and illustrator from McMinnville, Oregon. He is ever curious and enjoys delving into a bevy of creative outlets. The classic Northwest dilettante, he plays drums, writes songs, loves food & drink, devours cinema and occasionally harnesses his secret karaoke powers. His art aims at playfully dark humor, sometimes cute and sometimes creepy.